Gro-Guard Frost Cloth by Atmore is a trusted blanket by Atmore Industries Protect your Crop from FROST, INSECTS, EXTREME CHANGES in Weather and Heavy Rain! 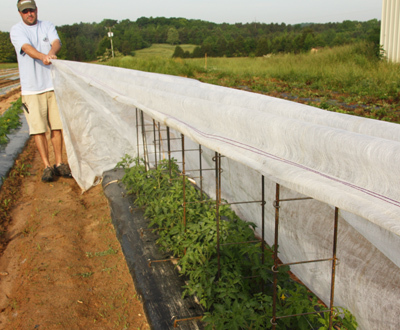 GG-20 0.6 oz (10' to 50' widths) is a Lightweight Frost and Insect Cloth-Cover. Protects down to 27 degrees F.
-- Gro-Guard UV by Atmore Industries. -- Protect your Crop from FROST, INSECTS, EXTREME CHANGES in Weather and Heavy Rain!! GG-20 is excellent for Insect and Pest Control because it is lightweight and and still lets in the light and water. 100% UV Stabilized to promote re-use. At night, Gro-Guard slows heat loss. Earlier/increased yields. Many Sizes IN STOCK and Ready to Ship TODAY! * Please call or email to order Custom Sizes. 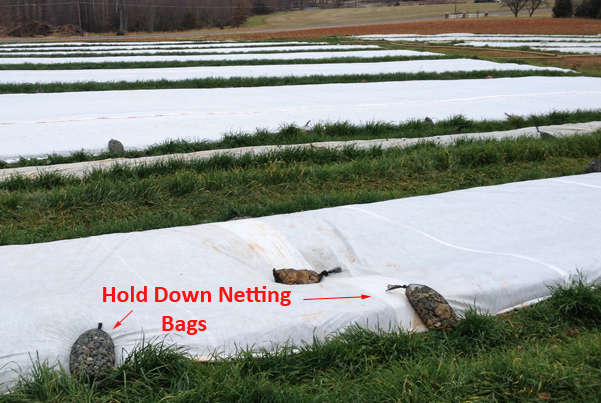 Rolls of Hold Down Netting. Make Bags and Fill with Rocks for holding down Frost and Insect Covers. GG-34 1.0 oz (5', 10', 20' Widths) Medium Weight Frost Protectant Cover. GG34 Protects down to 24 F and transmits 70% light.